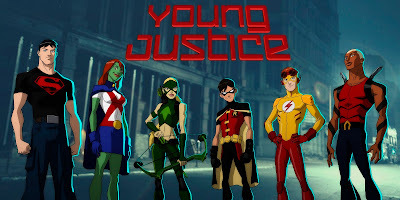 With the news that Young Justice is returning for a third season, it seemed like a good time to finish off my posts about my Sentinels of the Multiverse RPG. I've previously discussed choosing the system and the character building rules. Now, it's time to meet the characters who inhabited my game. As I've said before, the characters of Sentinel Comics are homage to the comics we all know and love, with their own world filled with comic-book drama. Many of the characters have analogues, singular or combinations, in the DC or Marvel properties. For example, Legacy, Tachyon, and The Wraith are all homologous to Superman, The Flash, and Batman, respectively. Tempest, on the other hand, is more of a blend of the Martian Manhunter, Aquaman, and Storm. And . . . hero pose! In total, there were nine characters in my game. This wasn't just because I had a bunch of fun making characters. I made the characters so that we could just jump into playing the game; if the people available to play at any given time changed, it wouldn't matter because there wasn't any connection between the players and the characters. Plus, with a variety of options for the players to choose from, they could experiment with different mechanics and play styles. 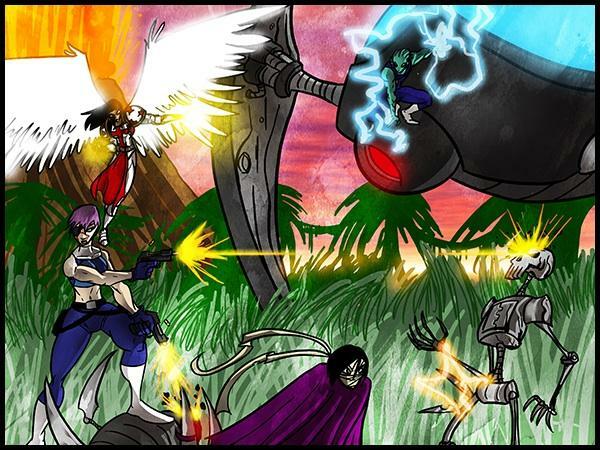 Without further ado, meet the cast of the Young Sentinels. For some reason, this is an outdated version of the character, but it's close enough. 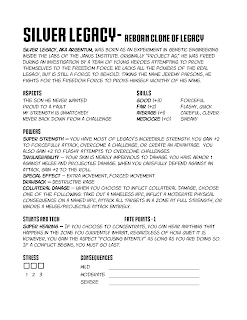 Silver Legacy was a clone of Legacy, developed by a covert government agency to be a counter to Legacy's power if he were to go rogue. (Not that they had any reason to fear that.) This made Silver Legacy very much like Superboy, and I played off of the cartoon incarnation's personality traits as well. 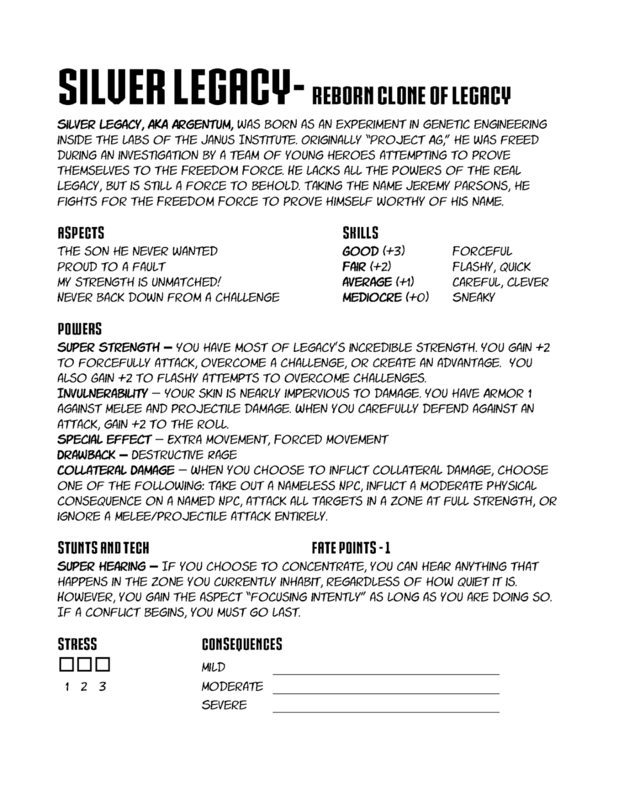 The PCs rescued Silver Legacy from a secret facility in the first session. 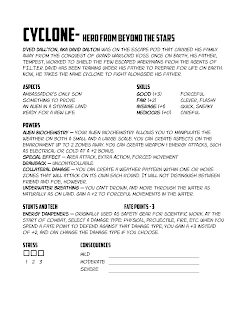 Tempest is an alien, of a race known as Maerynians, and a refugee from a war-ravaged world who ended up on Earth while fleeing from the forces of Grand Warlord Voss. 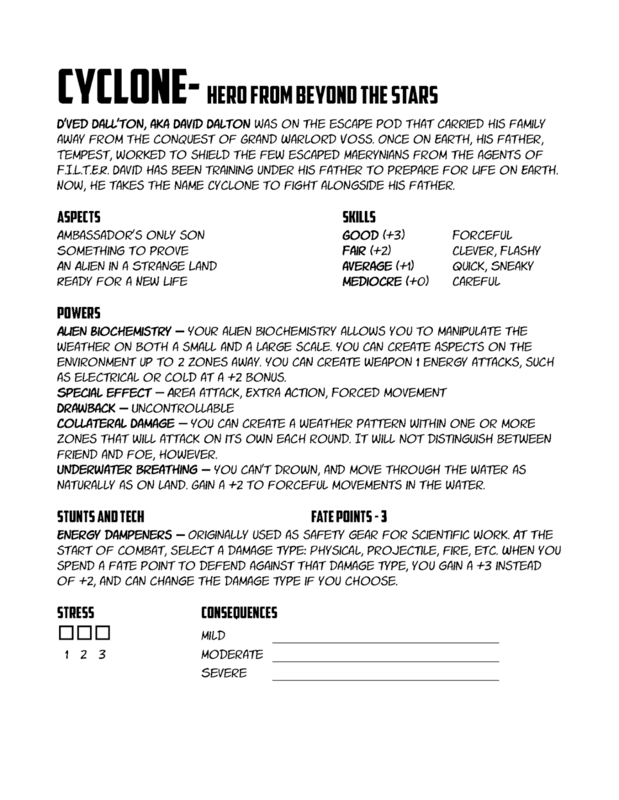 Cyclone is his son. 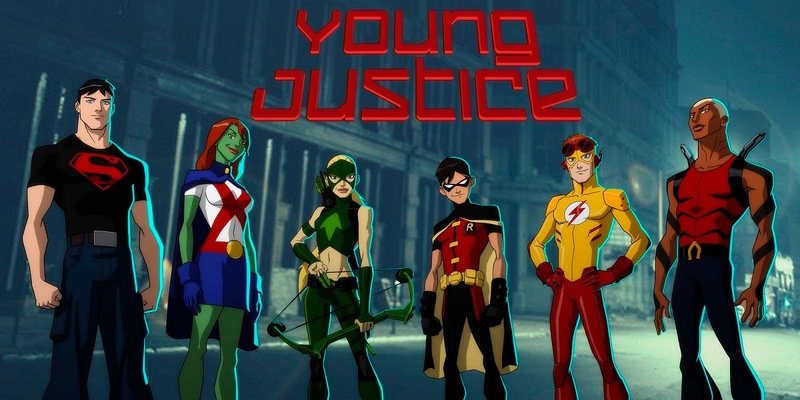 Not exactly an Aqualad analog, but the closest to the Young Justice cast. He was meant to be overly eager to live up to his father's accomplishments, without realizing just how alien his presence truly is on Earth. Incidentally, the Maerynian refugees ended up taking up residence in the ruins of Atlantis. It seemed appropriate. Vanessa Long, The Visionary, has a complicated history in the world of Sentinel Comics. Her tremendous psychic powers were the result of military experiments performed on her mother while Vanessa was still in the womb. Her parents died when she was born because of said powers. Once her powers developed, she went back in time to prevent the death of her parents. Unfortunately, her young paradoxical self still manifested nightmarish psychic powers as The Dreamer. In my take on the Sentinel Comics universe, The Visionary later died à la Dark Phoenix. The Dreamer remained, and resolved to pick up the late hero's mantle. 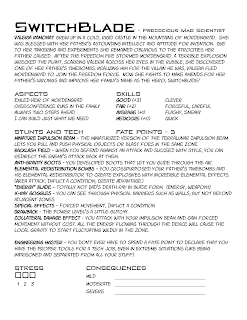 Because her powers are unstable and dangerous, the Freedom Force keeps her around both to train her and to monitor her stability. Flashpoint is the polar opposite of an existing Sentinels character, Absolute Zero. Absolute Zero is like a mash-up of Mr. Freeze and Iron Man, trapped in a suit that protects him due to his sub-zero body temperatures; the suit allows him to channel those temperatures into ice blasts. 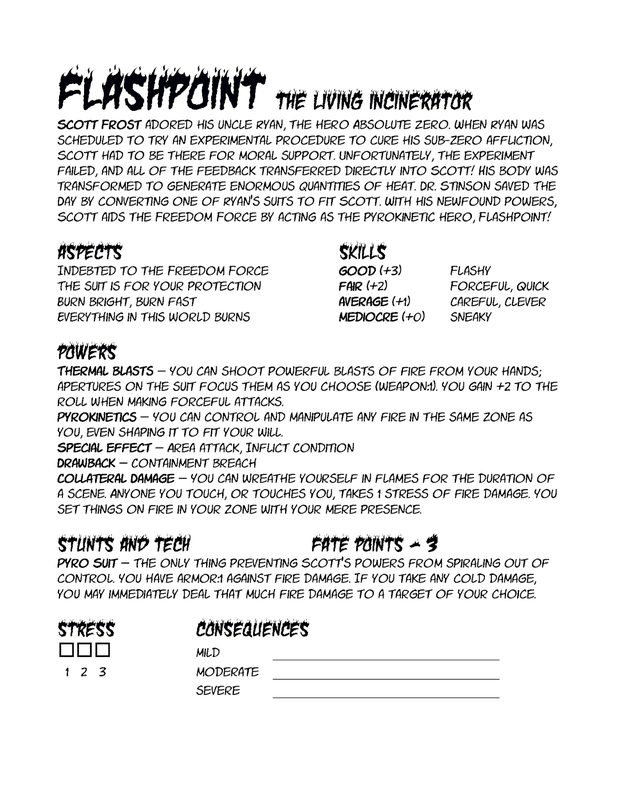 Flashpoint suffers from the opposite problem, with body temperatures so high that the world around him burns. This makes him somewhat akin to the Human Torch. As he can't control the effect, however, his suit makes it possible for him to walk in the world without destroying it, and allowing him to channel it to "productive" ends. 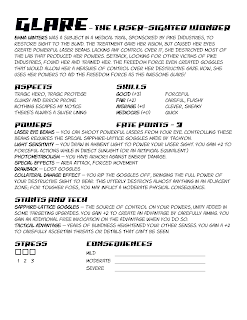 Glare was a blind girl who received her powers from a scientific experiment gone wrong. Her sight was restored, but she ended up with uncontrollable laser vision. She takes an obvious cue from Cyclops in this way. I didn't get to do much with her character. She was meant to be somewhat clumsy and inept in combat, a result of being blind her entire life and thus not a physical powerhouse. Also, my initial plan was to have her power level change depending on the level of ambient light, since she absorbs and channels the light. However, it ended up being a rather clunky mechanic that I had to simplify. 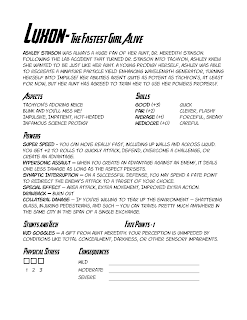 Luxon is the niece of Tachyon. A great admirer of her aunt's scientific prowess, she attempted to recreate the experiment that gave Tachyon her powers. She succeeded, gaining the super speed that made her aunt's heroics possible. 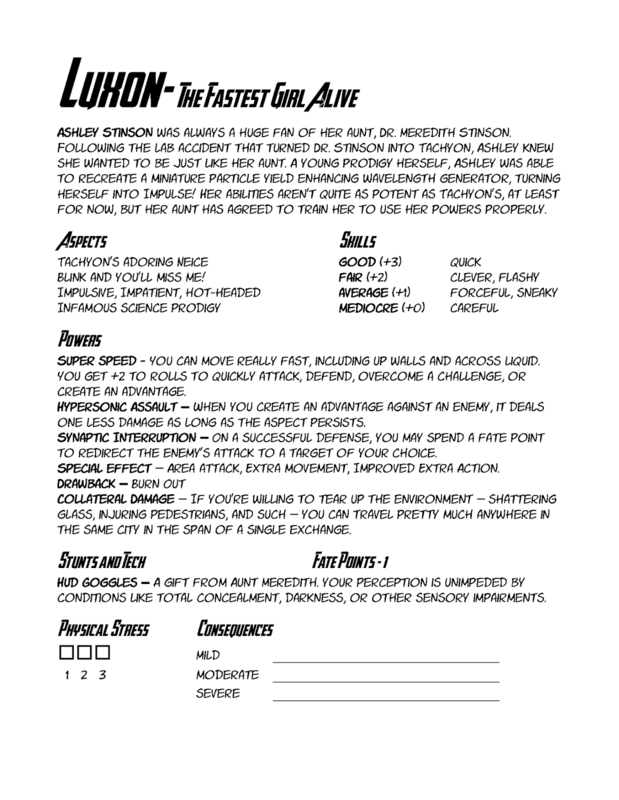 This makes Luxon very much like Kid Flash. Once again, I also borrowed from Kid Flash's personality as he was in the cartoon. For what it's worth, converting Luxon from Fate Core to Fate Accelerated was complicated. 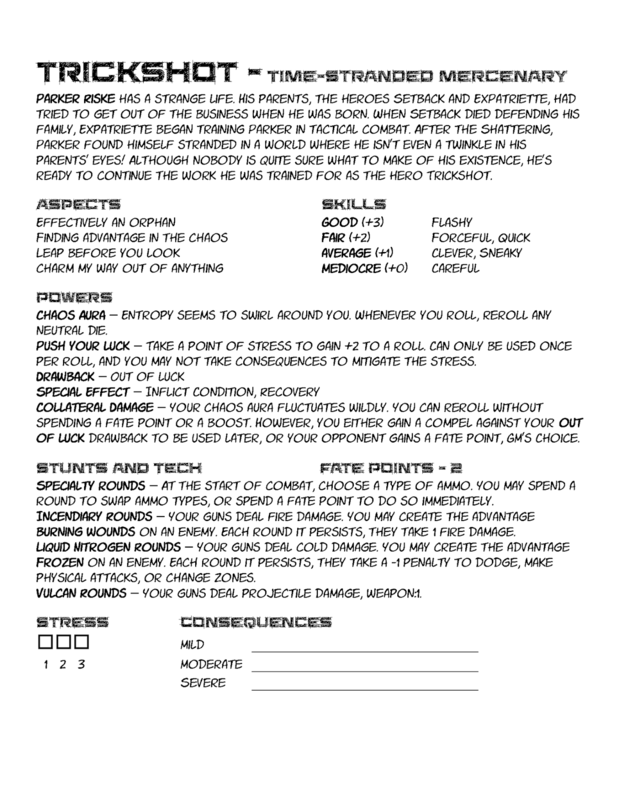 The "speedster" example given in Venture City Stories wasn't particularly friendly to Fate Accelerated. What Robin was to Batman, Spectre is to The Wraith: A young ward taken in and trained to fight crime after she lost her family to the blight of Rook City. Building Spectre was complicated. I wanted her to be adept in martial combat, but it seemed like she shouldn't be competent in the same way that, say, Silver Legacy was. So assigning the right combination of skills and stunts was key. But handling stunts was an issue itself. The Venture City rules associates the Special Effects/Drawback/Collateral Damage features with actual superpowers. Being unpowered, it seemed like Spectre ought to skip those features but get more fate points in compensation. 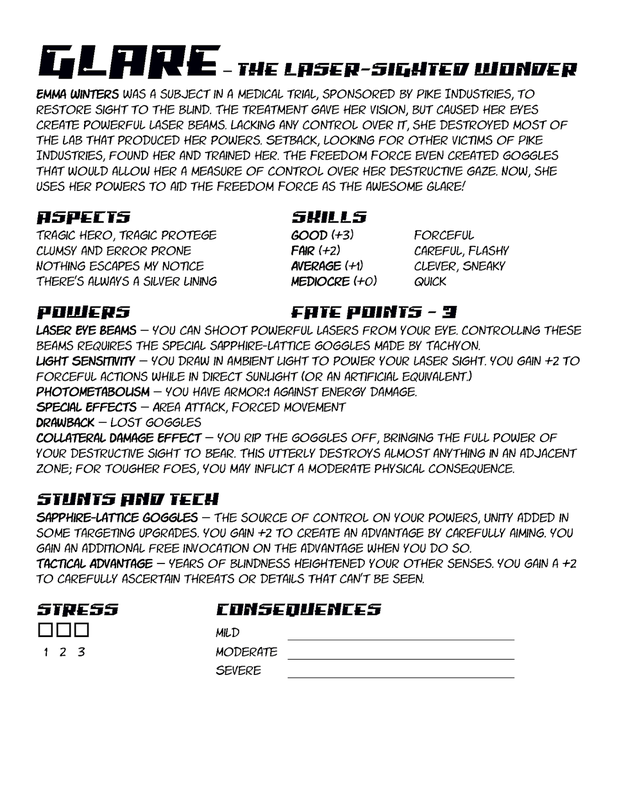 Ultimately, I just applied those power features to her anyhow; it's one of the unique and fun features of the rule system, so why make someone go without? 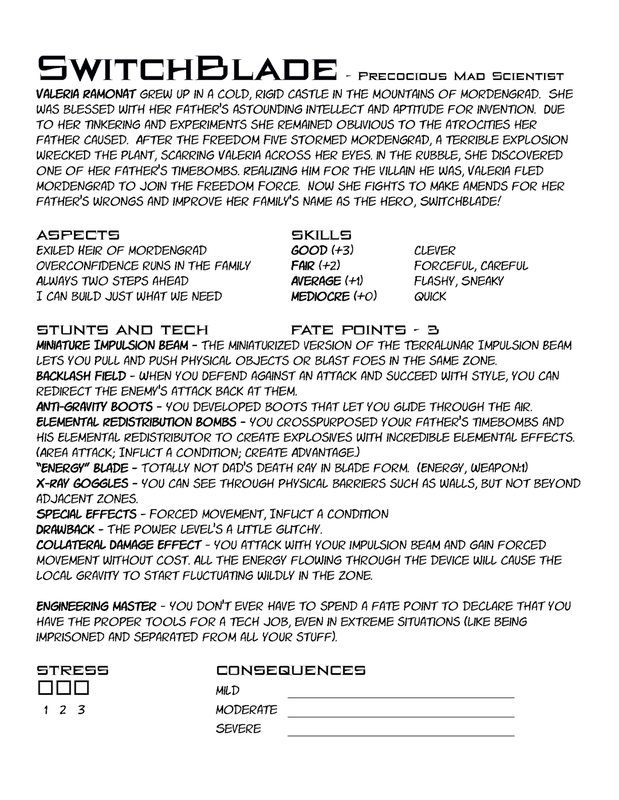 Switchblade was actually the creation of one of my players; it warms a GM's heart when you have a player that gets so enthusiastic about your game that he makes characters for it even when he doesn't have to. Switchblade is the daughter of Baron Blade, a Lex Luthor-like figure and Legacy's nemesis. A scientist and engineering genius after her father, she turned to join with the heroes after she realized the extent of her father's villainy. One of the central features of the Sentinel Comics story is time travel/alternate dimensions. It's weird, but you see so much of it in Marvel and DC comics that it's just another vehicle for drama. In my iteration of the setting, the conclusion of a temporal catastrophe ended up stranding people from various alternate worlds in this reality. One of those people was Trickshot: The son of two heroes, Expatriette and Setback, who weren't actually together in this world. Awkward. Trickshot went through a lot of iterations. The use of various guns wasn't too difficult, but the aura of chaos and randomness borrowed from Setback was difficult to put together in a way that made it actually useful to the player. If I ever revisit these characters in a game, I may still change how those powers work. 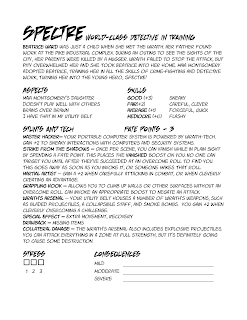 Some of these characters weren't particularly original, but I had fun building them using the rules I'd developed for a Sentinels Fate game, and they fit into the world of Sentinel Comics just fine. 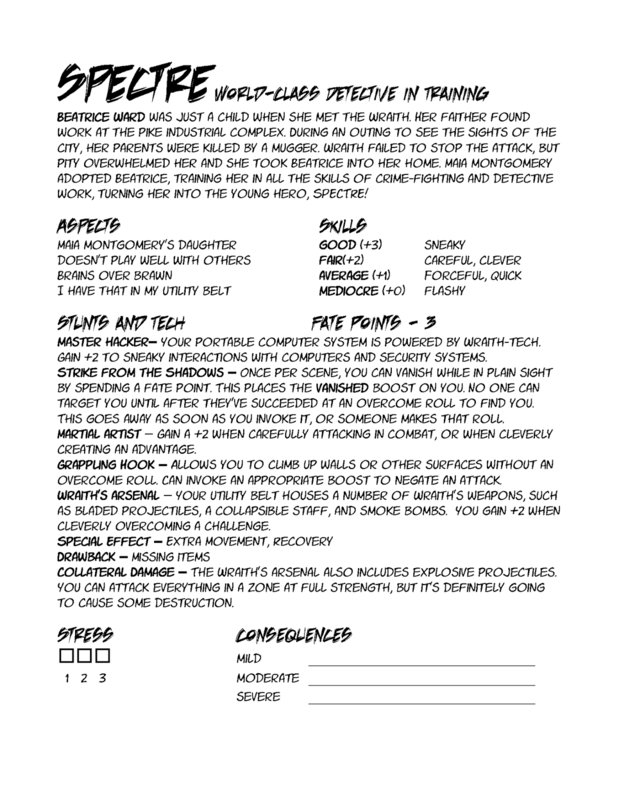 I still have one more post I'd like to write about this game, explaining the spin I put on the Sentinel Comics setting and the story for the sessions. I also want to talk about some of the ideas I tried to incorporate into the game that did or didn't work.